This 4-piece stainless steel nail kit, perfect for travel. Includes a clear, reusable pouch for easy, convenient storage. 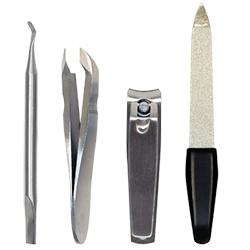 Kit Includes: Cuticle Pusher, Cuticle Nipper, Nail Clipper, Nail File.